The YUI ProgressBar Control provides a visual means of showing progress of an ongoing operation. The ProgressBar can be enhanced via CSS styles to provide different colors, shapes and textures. The bar can move horizontally or vertically, forward or reverse. The movement can be enhanced by using the Animation utility. A textual representation of the bar can be displayed, which is also available for WAI-ARIA screen readers. Examples: Explore examples of the ProgressBar Control in action. API Documentation: View the full API documentation for the ProgressBar Control. Release Notes: Detailed change log for the ProgressBar Control. Download: Download the ProgressBar Control as part of the full YUI Library at YUILibrary.com. See the examples below in Using ProgressBar or the API Documentation for more details. The length of the bar represents the value of the value configuration attribute. It is scaled so that the initial edge of the bar (i.e., on a bar with direction set to 'ltr' it would be the left edge) represents the value held in the minValue attribute and the end edge is set to maxValue. The value, minValue and maxValue attributes are plain numbers in arbitrary units, the ProgressBar scales them to and from actual pixel values. If the Animation utility is loaded, the ProgressBar can use it to move the bar by enabling the anim configuration attribute. This attribute accepts either a boolean to enable/disable animation or an instance of YAHOO.util.Anim. When read, anim will return the instance of the Animation object created or null if there is none. The properties of the Animation object can then be accessed directly to set the behavior of the bar, usually with duration and the easing method. Note that any easing affect is visual in nature only and the underlying value itself does not have any easing applied to it. As a side affect, the bar may be rendered outside the bounds of its container during easing. The following code makes the movement last for 3 seconds and bounce both at the start and end of the movement. The ProgressBar component makes use of several CSS classes to style the bar. You can either use the "Sam" skin CSS provided by default, or you can create your own. If you create your own, you'll need to use the class names the ProgressBar assigns to its elements. height Overall size of the ProgressBar. It can also be set via the width and height configuration settings. background-color Background to be used on the area the bar is not covering. .yui-pb border Border around the component. background-color Image or color to use for the bar itself. .yui-pb-bar margin Offset from the edge of the ProgressBar to where the transparency of the mask starts. background-color Image or color to use for the bar while it is moving. .yui-pb-mask div background-image Mask with transparencies to allow the bar to show through. .yui-pb-caption font and others This style is not actually used by the ProgressBar, but is is defined in the "Sam" skin to be used to display the value of the bar. To let the bar be seen through the mask that covers it, mask image needs to support transparencies, such as a PNG or a GIF. Since the opaque areas of the mask will hide some areas of the ProgressBar, when using masks that take some space at either end, set the margins on the bar itself (.yui-pb-bar) to keep the bar within the transparent section. The ProgressBar has a predefined style for the "Sam" skin (yui-skin-sam). Since this style is often set at the document body, if you want to customize a particular ProgressBar while retaining the skin for other elements in the page, these are the style definitions that will cancel those preset styles where #myProgressBar1 represents the id of the ProgressBar that is to be styled differently. The ProgressBar inherits from the Element utility, which exposes the before and after change events for configuration attributes. Thus there are, for example, beforeMinValueChange and minValueChange events. The before event listeners can return false to reject the change. They both receive the old and new values for the corresponding attribute. The ProgressBar adds three events that signal the movement of the bar. The start event will be fired right before the bar is about to move. The progress event fires at least once while the bar is moved. If animation is enabled, it will fire as many times as the Animation fires its own onTween event but it will scale the pixel value of the bar to a value in whichever units the implementer has set. Finally, the complete event fires when the bar reaches its set value. Handlers for all three events receive as its single argument the actual value that the bar represents at the instant they fire. The progress event will fire only once when animation is not enabled. The ProgressBar supports WAI-ARIA as specified for the "progressbar" role (see the W3C specification). The ProgressBar container has tabIndex="0" and has role and role-specific settings as described in the specification. Since the ProgressBar cannot know what unit the value corresponds to, it cannot on its own provide a meaningful aria-valuetext value. The ariaTextTemplate configuration attribute allows the implementer to set the template to be used for that value. The ProgressBar will produce a text assembled via YAHOO.lang.substitute from the template in the ariaTextTemplate configuration attribute. The ProgressBar makes the values of the value, minValue and maxValue available as tokens for substitute to replace in the template. The normal mechanism for scaling images in a browser is not acceptable for scaling the mask. Masks are usually thin frames around the bar, often with small single pixel-wide features. With normal scaling, these features might be lost. Instead, the ProgressBar cuts the mask into four quadrants. This set of diagrams shows how the mask image is used. 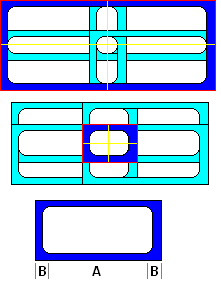 In the top two images, the blue sections enclosed in red represent masks of very different sizes, both made of the very same base image, which is shown as the third imagex. The red line outlines the container used to hold the mask which is of the same size as the overall ProgressBar. The container holds four quadrants, marked by the yellow lines. The same mask image is set as the background for each of the four individual quadrants but instead of letting it tile normally, we use the background-position CSS attribute so each is aligned to its own external corner. The blue area shows the corner section of the mask image that is visible in each quadrant, enclosed in between the ProgressBar edge in red and the edges of the quadrants in yellow, the light blue areas are the parts of the same image that fall outside of the quadrants and are invisible. If the top ProgressBar were to be stretched a little more, the now invisible edges opposite each visible corner would start to show. On the other hand, if the lower ProgressBar were to be reduced, the yellow lines would start eating into the rounded inner corners and the inner contour would not blend but meet at an angle. If we call A the length of the straight section of each edge and B the length of the section from the edge until the rounded inner corner meets the straight section so that the width of the original mask is A + 2 * B, we can use that image as a mask for any ProgressBar that is at least 2 * B on the side (no straight section visible) to 2 * A + 2 * B (the straight sections are seen twice, once in each contiguous cell). ProgressBar only works correctly if width is specified in pixels (bug 2529310). The ProgressBar is affected by the bug: "JS positioned elements get misplaced on zooming" on Safari 4 and other recent WebKit derivatives. The "rtl" direction is not supported in IE6. ProgressBar is functional in the target mobile browsers.